1904, 10¢ Louisiana Purchase, in the very scarce dark red brown shade, o.g., never hinged, perfectly centered with large evenly balanced margins all around, rich lustrous dark red brown color on bright fresh paper, a Superb gem; 2013 P.S.A.G. & 2015 P.S.E. certificates, both Graded (Gem 100, SMQ $12,500). 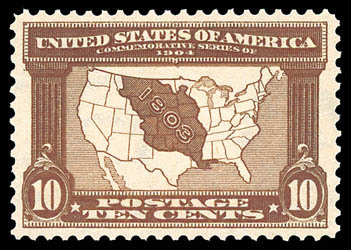 AN OUTSTANDING NEVER HINGED EXAMPLE OF THE 10¢ LOUISIANA PURCHASE ISSUE - ONLY TWO EXAMPLES TO BE AWARDED THIS SUPERB GRADE BY THE P.S.E. WITH NONE HIGHER.